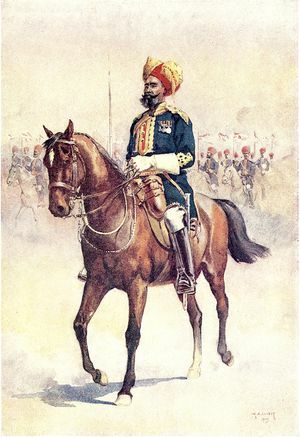 The 14th Murray's Jat Lancers, also sometimes known as the Murray's Jat Horse, was a cavalry regiment of the British Indian Army. The regiment was first raised at Aligarh as an irregular cavalry unit in 1857 as the Jat Horse Yeomanry, for the East India Company by Captain John Murray then serving with the Gwalior Contingent. It was raised from 250 sepoys and 120 sowars (cavalrymen) recruited from the Jats of the rural areas of Hathras, Mathura, Bulandshahr, Aligarh, and Khurja in UP, and Palwal and Hodal in Haryana, who were offered by Thakur Gobind Singh, a Jat chieftain of Khair in Aligarh, to combat the 1857 uprising, and thus became the first regiment to be manned completely with Jat troops in the British Indian Army. Until 1861 it was paid for by private funds of the British officers and Indian Risaldars. Later the Regimental Centre and Officers' Mess was established at Palwal. It participated in a number of actions in 1857-58, especially at Meerut, Delhi and Lucknow, but did not qualify for any battle honour. Subedar Pratap Singh was the first Subedar of the HQ Squadron of the regiment in 1857-1861. Murray's Lancers subsequently served in the Bhutan Field Force. The regiment formed part of the cavalry brigade of the Kabul Field Force during the 1878-79 Afghanistan War. The regiment participated in a difficult cavalry charge over extremely difficult ground and routed the Afghan line at Charasiah, 15 km from Kabul, on 6 October 1879 for which the regiment was awarded the battle honour "Charasiah" and the theatre honour "Afghanistan 1878-79". I always remember the good work done by the regiment (14th Jat Lancers) when we were hard pressed by the Afghans in the Chardeh valley on the 11th December 1879. The retirement by squadrons was carried out as if on parade. The regiment was merged in 1922 with the 15th Lancers (Cureton's Multanis) to form the 20th Lancers which was transferred to India after partition in 1947. 1921 Amalgamated with 15th Lancers (Cureton's Multanis) to form 14th/15th Cavalry. The 14th Murray's Jat Lancers appear as (Jat Lancer) in the computer game Age of Empires III: The Asian Dynasties. ^ a b c Nath, Ashok (2009). "14th Murray's Jat Lancers". Izzat: historical records and iconography of Indian cavalry regiments, 1750-2007. Centre for Armed Forces Historical Research, United Service Institution of India. pp. 106–107. ISBN 978-81-902097-7-9. ^ a b Sandhu, Gurcharn Singh (1981). The Indian Cavalry: History of the Indian Armoured Corps. Vision Books. ISBN 978-81-7094-013-5. ^ Singh, Sarbans (1993). Battle Honours of the Indian Army 1757 - 1971. New Delhi: Vision Books. pp. 138, 139. ISBN 8170941156. ^ Nath (2009), pp 581-583. ^ "Age of Empires III: The Asian Dynasties, Consulates and mercenaries". Archived from the original on 2008-09-14. Retrieved 2008-08-03. John Gaylor: Sons of John Company: The Indian and Pakistan Armies 1903- 1991. Woodward & Van Slyke: The Times History of the War: The Battlefield of Europe.